Edinburgh, one of those towns in Scotland that is on the must see list and now a must see distillery, Glenkinchie. Of all of the regions of scotch that I have tasted whisky from, the Lowlands, is the one I have the least amount of experience with. The lowlands do not produce the major stars in scotch whisky today, yet produce some lighter, sweeter whisky. In fact, there are only a couple of working distilleries (Auchenotoshan being the other) with some possibilities of a future operation. Rosebank is a collectible but no longer existing distillery of the Lowlands. Not knowing what to expect of this whisky I approached it with high curiosity. After a few tastes I was intrigued and pleased. I really enjoy the fact that this whisky had a complete different side to it. I also noted some light tobacco coming through the finish which spurred me to go to the humidor and grab the lightest, smoothest cigar I had. I pulled out a Diamond Crown, Connecticuit wrapper. Hardly a cheap cigar. Yet I thought of what I had, it was the best match. 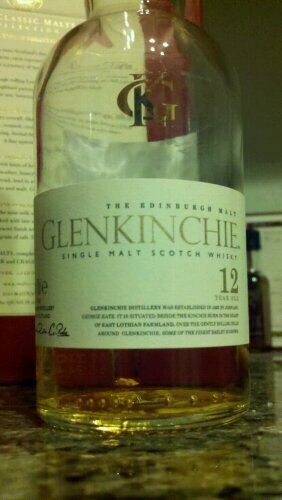 The Glenkinchie is light, grassy and soft, slightly rubbery on the palate. It has a noteable finish, staying on top of the tongue with some pep that is not annoying or heavy. There is no bitterness in it at all. I find a bit of saltiness on the finish after drinking it for awhile. As far as being paired with the Diamond Crown, I wasn’t as pleased as I thought I would be. The DC did its job, smoked wonderfully and is one of my favorite cigars. It was not an adversarial meeting of the two, but there was no magic. The next day I tasted the Glenkinchie and did not have a cigar. I found this better. I think this makes a good sippin whisky. I would enjoy this whisky with some good dry cheese or fruit. Its a good dram. I might also recommend this with seafood, boiled shrimp especially.